Imagine having all of the answers to the test prior to taking the final exam. That’s exactly how UFC featherweight king Jose Aldo (Pictured) feels entering Saturday’s title fight against Chad Mendes. Although the opponent has changed, the Brazilian believes he’s seen this all before and doesn’t think the result will be any different. “Chad’s style of fighting is very similar to Urijah Faber’s. The height, the wrestling, the way they move … they are very similar,” Aldo assessed. “Mendes is younger than Faber, but it’s basically the same type of fight for me. If Aldo’s opting to take the been-there-done-that stance, he should enter UFC 142 with an abundance of confidence. After all, “Scarface” did do THIS to Mendes’ mentor en route to collecting a lopsided decision win in April 2010. However, Mendes has promised to pack a takedown attack Aldo has never experienced before. Nonetheless, the baddest 145-pounder on the planet isn’t fazed in the least. 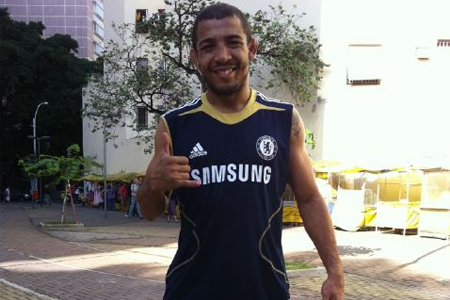 What Aldo has yet to experience is entering the Octagon in front of his Brazilian brethren. It’s something he’s always dreamed about and can’t wait to come to fruition. UFC 142 takes place inside HSBC Arena in Rio de Jenairo.